In this video, the third in our IT in the era of disruption series, get answers to your questions about automation, virtualization and software-defined networks (SDN). Discover a strategic approach to network transformation that aligns with your business and technology needs - for today and for tomorrow. Today’s business challenges are driving the need for network transformation. To compete, innovate and grow, many enterprises are embracing cloud, analytics, social and mobile technologies – but is your network ready? Learn how to build an agile, security-rich network capable of growing with your business. 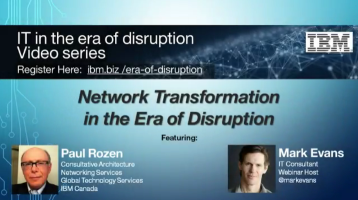 IBM’s Paul Rozen will share how new network technologies and automation can drive agility and efficiency throughout the organization.